Both with 7 - Jimmie Johnson and Dale Earnhardt Jr. The pressure is on as we enter the second race of the Eliminator Round. We go from the smallest track on the circuit to the typical 1.5-mile oval format, undeniably a relief for many drivers. Look for these drivers to run well this week: Kevin Harvick, Jimmie Johnson, Brad Keselowski, Clint Bowyer, Greg Biffle, Carl Edwards, Kyle Busch and Joey Logano. My 2 Cents: Last year the Texas race had us all impressed over the high speeds, and Tony Stewart earned his first pole. After a bizarre race last weekend, it would be nice to see speed as the top news-getter. My no-brainer this week is Kevin Harvick. My next picks are: Joey Logano, Tony Stewart, Greg Biffle, Kasey Kahne and Clint Bowyer. I will round out my team with Danica Patrick and Ryan Blaney. My final four: Kevin Harvick, Tony Stewart, Kasey Kahne and Ryan Blaney. 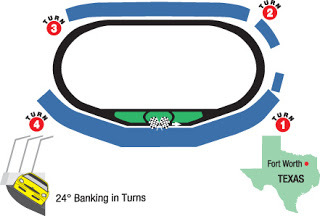 The third-place position is the most proficient starting spot in the field at Texas Motor Speedway, producing more wins than any other starting position (six) with the most recent being Jimmie Johnson in the fall of 2014. A total of 18 different drivers have won at Texas Motor Speedway, led by Jimmie Johnson with five victories. Seven drivers have multiple wins at Texas Motor Speedway: Jimmie Johnson (five), Carl Edwards (three), Greg Biffle, Jeff Burton, Denny Hamlin, Matt Kenseth and Tony Stewart each have two. Roush Fenway Racing leads the NASCAR Sprint Cup Series in wins at Texas Motor Speedway with nine, followed by Hendrick Motorsports with seven and Joe Gibbs Racing with four. Almost 80 percent (23 of the 29) NASCAR Sprint Cup races at Texas Motor Speedway have been won from a top-10 starting position.